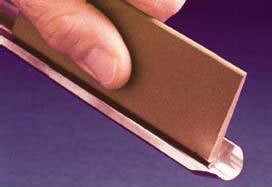 The Norton slip stone is designed to be versatile for sharpening carving tools, one of the edges of the Superslip has a round edge that tapers to sharpen gouges; 4-1/2in. x 1-3/4in. x 1/4in. x 1/16in. 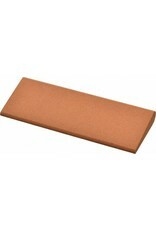 Norton® India® Medium Grade Orange/Brown 4 1/2" X 1 3/4" X 1/4" X 3/32" Aluminum Oxide Round Edge Abrasive Slip is designed for use in precision sharpening and honing of bead planers, curved knives and tools, molders knives and wood gouges. 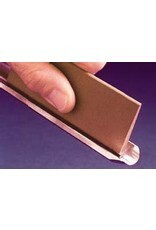 Round edge, fast-acting slip holds its shape and is long lasting. Stones, manufactured with aluminum oxide abrasive, are preferred for imparting durable, smooth-cutting edges and for close tolerances. Abrasive slip imparts the finest, uniform finish on curved knives and tools, molders knives, wood gouges, bead planers, carving tools and carbide-tipped tools.